You can get both the golden color you remember with SafeGard CC 3400 chromate-free conversion coating. SafeGard CC-3400, a chrome free surface treatment, is electrically conductive and is used to enhance paint adhesion, and prevent corrosion due to humidity and salt spray. 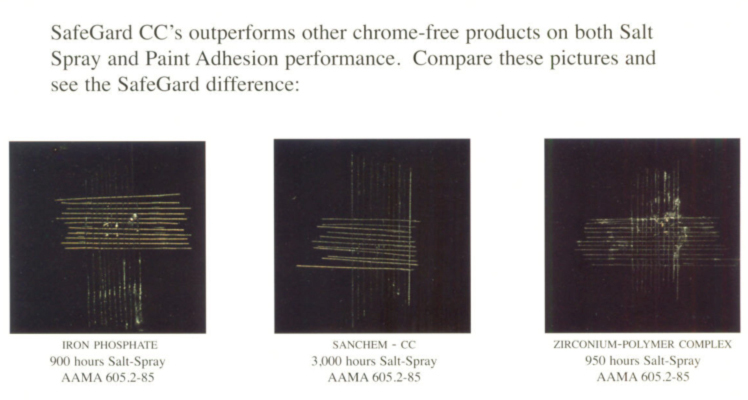 This breakthrough chromate free conversion coating technology has also been tested by Boeing in St Louis. Missouri. 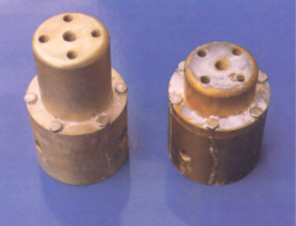 They stated that it passes both the corrosion protection and electrical conductivity requirements for Mil-C-5541. Use SafeGard CC-3400 on aluminum and aluminum castings. Chromate-free conversion coating SafeGard CC-3400 is Qualicoat approved. A growing number of USA and European companies are specifying chromate-free SafeGard CC-3400 on aluminum surfaces and getting the golden chromate color to meet Europe's RoHS Directive. With chrome-free SafeGard® CC-3400 you will also be positive that you will pass RoHS Compliance testing even if they test using XRF. This chrome free surface treatment for aluminum is UV stable, non-sludging, heat stable to over 400°F, a true reactive aluminum conversion coating. Which SafeGard CC Do I Need? Chromate-Free SafeGard CC-3400 is the RoHS compliant aluminum surface treatment will give you a clear coating in 30 seconds and a gold color in 1 minute. 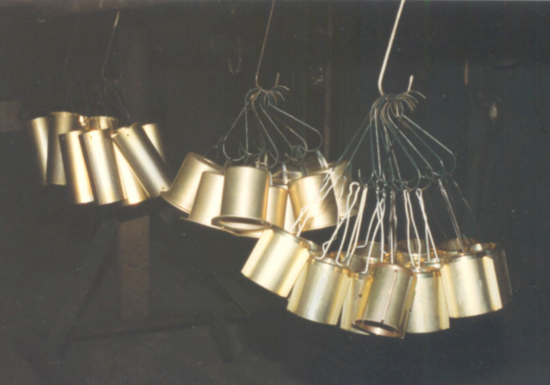 This economical conversion coating is electrically conductive, UV stable, heat resistant, provides excellent corrosion resistance and paint adhesion. Used extensively when surface finishing with paints and powder coating applications (Qualicoat Approved). SafeGard CC-Seal#2 is a reactive aluminum conversion coating that can be used to give you a long-term clear shine on aluminum. Due to the reactive bond with the aluminum, this coating will not wash off at the car wash, in high humidity or by the ocean. This final seal will help you achieve maximum corrosion resistance and paint adhesion on corrosion susceptible alloys such as 2024 aluminum and 380-cast aluminum. SafeGard 4100 - Dry in place aluminum surface treatment to prevent aluminum corrosion and discoloration under humid conditions. SafeGard CC-4100 is not affected by heat so it is often used in areas that reach high heat such as 400-500°F. 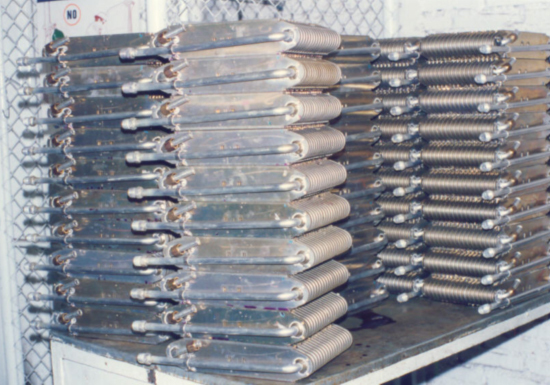 Used to prevent corrosion on in process aluminum parts, and as a surface treatment before painting aluminum. SafeGard CC-5000 is a chromate-free inorganic seal for anodizing and aluminum oxide coatings. SafeGard CC-5000 is a direct replacement for standard dichromate seal used in military applications specification MIL-A8625C. It contains no organics or toxic environmentally unfriendly inorganic. Will not breakdown with heat above 160°F as will dichromate seals, almost identical color to final product and is used at almost the same temperature and time as a chromate seal. This is not an iron phosphate coating. Who has tested and Approved Safegard CC? Touchstone Systems & Services Inc: – SafeGard CC-3400 Passed General Motors tests on a 360 cast aluminum alloy Part#H878: Initial Tape Adhesion, Humidity and Tape Adhesion, Neutral Salt Spray & Corrosion, Dime Scrape, Thumbnail Hardness, Gasoline Resistance Dip, Gasoline Resistance Puddle, Oil Resistance Dipping, and Chip Resistance Testing per GM 9508P Method B @ -30b. 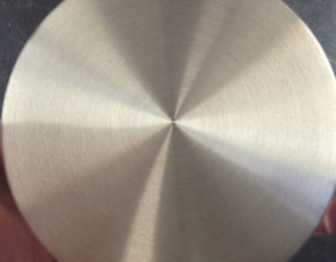 Stork Technimet Inc: Passed 168 hours Salt Spray testing per Mil-C5541E on aluminum alloy 7075 following ASTM B-117. Stock Technimet is an ISO-Certified lab. Sanchem’s SafeGard CC is Qualicoat Approved - Testing Procedures this product passed for approval included: Resistance to boiling water Method2 (Pressure Cooker), Constant climate condensation water test, Machu Test according to QUALICOAT Specifications, Acetic acid salt spray test according to ISO-9227, Adhesion according EN ISO-2409, Cupping test EN ISO-1520, Bend Test EN ISO-1519 and Impact Test ASTM D-2479. 3M's Scotchlite Reflective Sheeting for Traffic Signs – Safegard CC-3400 is 3M approved. 3M required that a hexavalent chrome pretreatment be used under 3M’s Scotchlite Reflective Sheeting for Traffic Signs. 3M required that SafeGard CC-3400 pass both a 6 months outdoor exposure testing at LaQue Corrosion Services in Wrightville Beach, NC and Neutral Salt Spray testing which was performed at Phoenix Chemical laboratory in Chicago, IL using both 6061 & 5052 aluminum alloys. Alloy Wheels International @ Kent laboratory Report – Wheel Type T498 - SafeGard CC-3400 meets their paint pretreatment requirements. Tests Run on painted wheels: CASS (Copper-Accelerated Acetic Acid Salt Spray), Water Soak FLTM B1 104-01, ambient road gravel, -10c road gravel, neutral salt spray 1000 hours & thermal shock FLTM B1 107-05.